› Author Affiliations Funding ATTRACT was supported by grants from the National Heart, Lung, and Blood Institute (NHLBI), National Institutes of Health (NIH) for the clinical coordinating centre (U01–088476 to Dr. Suresh Vedantham, Washington University in St. Louis) and data coordinating centre (U01–088118 to Dr. Clive Kearon, McMaster University in Hamilton, Ontario); Washington University's Center for Translational Therapies in Thrombosis which is supported by a grant from NHLBI (U54-HL112303 to Dr. Evan Sadler) and Washington University's Institute of Clinical & Translational Sciences which is supported by a grant from the National Center for the Advancement of Translational Sciences (NCATS) (UL1-TR00044810 to Dr. Bradley Evanoff). Boston Scientific and Covidien (now Medtronic) provided supplemental funding. Study drug and funding were provided by Genentech (a Roche Company). Compression stockings were donated by BSN Medical. These companies played no role in the study's design, conduct, analysis or reporting. The study's development and conduct were supported by the Society of Interventional Radiology Foundation. Dr. Kahn is a Tier 1 Canada Research Chair holder and is an investigator of the Canadian Institutes of Health Research-funded CanVECTOR Network. Dr. Kearon is supported by an Investigator Award from the Heart and Stroke Foundation of Canada and the Jack Hirsh Professorship in Thromboembolism. The authors wish to thank the patients who participated, and the entire network of investigators and study staff at the coordinating centres, core laboratories and clinical centres. Background and Objectives The Acute Venous Thrombosis: Thrombus Removal with Adjunctive Catheter-Directed Thrombolysis (ATTRACT) trial reported that pharmacomechanical catheter-directed thrombolysis (PCDT) did not reduce post-thrombotic syndrome (PTS), but reduced moderate-to-severe PTS and the severity of PTS symptoms. In this analysis, we examine the effect of PCDT in patients with femoral–popliteal deep vein thrombosis (DVT) (without involvement of more proximal veins). 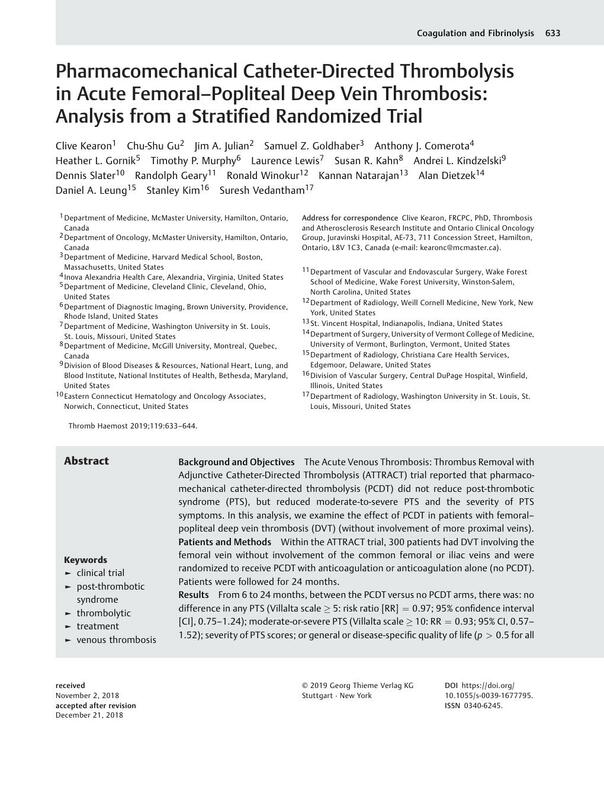 Patients and Methods Within the ATTRACT trial, 300 patients had DVT involving the femoral vein without involvement of the common femoral or iliac veins and were randomized to receive PCDT with anticoagulation or anticoagulation alone (no PCDT). Patients were followed for 24 months. Results From 6 to 24 months, between the PCDT versus no PCDT arms, there was: no difference in any PTS (Villalta scale ≥ 5: risk ratio [RR] = 0.97; 95% confidence interval [CI], 0.75–1.24); moderate-or-severe PTS (Villalta scale ≥ 10: RR = 0.93; 95% CI, 0.57–1.52); severity of PTS scores; or general or disease-specific quality of life (p > 0.5 for all comparisons). From baseline to both 10 and 30 days, there was no difference in improvement of leg pain or swelling between treatment arms. From baseline to 10 days, major bleeding occurred in three versus none (p = 0.06) and any bleeding occurred in eight versus two (p = 0.032) PCDT versus no PCDT patients. Over 24 months, recurrent venous thromboembolism occurred in 16 PCDT and 12 no PCDT patients (p = 0.24). Conclusion In patients with femoral–popliteal DVT, PCDT did not improve short- or long-term efficacy outcomes, but it increased bleeding. Therefore, PCDT should not be used as initial treatment of femoral–popliteal DVT. (NCT00790335).